HortSource » Stop! Who goes there? Whilst on the industry tour in Rotterdam in May, the group walked past this door. First the colour, and then the sign, caught my eye. It’s the entry door for the truck drivers that come to the tomato plant and is catering for the multinational labour force. What really struck me was how different languages presented the instruction that the truck drivers were to report here. 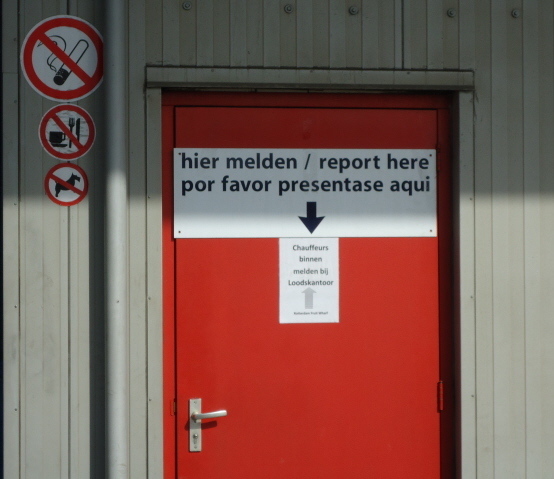 The Dutch and English versions are a simple and curt imperative, whereas the Spanish is a politely worded request. Does the language reflect how these respective countries are perceived to go about their work, I wonder? Posted: July 8th, 2011 under Produce.